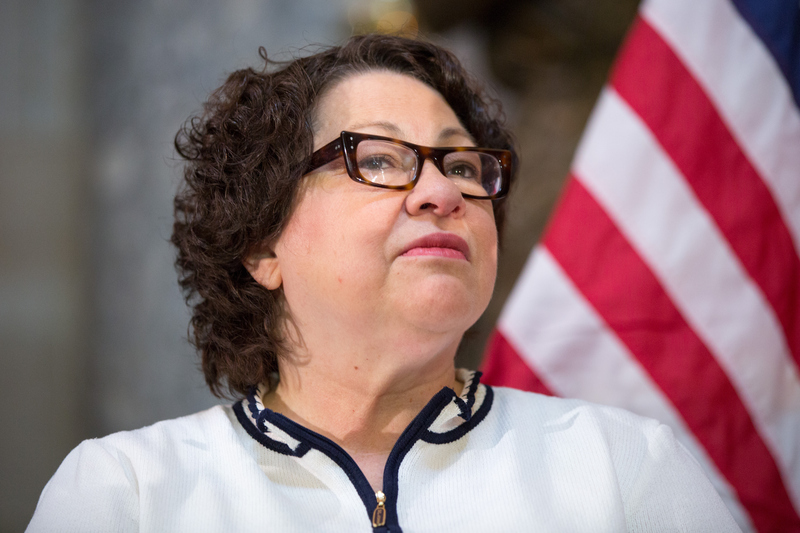 The shooting of 37-year-old Alton Sterling has lent eerie relevancy to Sonia Sotomayor's dissenting opinion of a Fourth Amendment "search and seizure" ruling on June 20. In 2006, cops illegally searched Edward Strieff without a warrant and found illegal drugs and other paraphernalia that were later used to convict him in court. When Utah v. Strieff made its way to the Supreme Court years later, a 5-3 majority ruled that the exclusionary rule did not apply to illegally obtained evidence if there is an outstanding arrest warrant for the person illegally searched. In other words, illegally obtained evidence can be used to convict a defendant in court. Sotomayor, alongside Ruth Bader Ginsburg and Elena Kagan, suggested the decision facilitates discrimination and puts too much power into the hands of authority. After police pinned Sterling to the ground and shot him, it feels as though Sotomayor's fear has come to fruition. Sotomayor began her written dissent by warning the public that the ruling gives police the ability to stop anyone on the street upon discovery of an unpaid parking ticket, for example. Depending on perspective, this could be perceived as a direct violation of an individual's Fourth Amendment rights, which secure "the right of the people to be secure in their persons, houses, papers, and effects, against unreasonable searches and seizures." Sotomayor continued to explain how the ruling may justify authority's tendency to racially profile bystanders. It is no secret that people of color are disproportionate victims of this type of scrutiny. ... For generations, black and brown parents have given their children 'the talk' — instructing them never to run down the street; always keep your hands where they can be seen; do not even think of talking back to a stranger — all out of fear of how an officer with a gun will react to them. Sotomayor feared the ruling would allow authority to treat minorities and low-income individuals as "second-class citizens." In short, something has futile as a parking ticket could make a citizen susceptible to a public search or even arrest. It's possible that such a ruling could instill fear in innocent people, seeding the "carceral state" that Sotomayor cautions against. It says that your body is subject to invasion while courts excuse the violation of your rights. It implies that you are not a citizen of a democracy but the subject of a carceral state, just waiting to be cataloged. The details behind the Utah v. Strieff ruling don't directly apply to Sterling, but the reasoning behind Sotomayor's dissent couldn't be more relevant. Her dissent is based in the case's broader implications: police tyranny, misconduct, and unchecked authority. On July 6, Sterling was forcefully approached by officers without warning after an individual called the Baton Rouge police station and claimed Sterling had threatened him with a gun. The call prompted a police response, and rightfully so. However, the response was simply incorrect, proving Sotomayor's predictions of police misconduct valid. The Department of Justice's civil rights division will investigate whether or not that was the case.